Mobile phones’ sizes and styles went through massive changes in the last few years. And as their looks and dimensions changed, so did their functions. With better capacity and bigger storage, mobile phones turned into veritable mini-computers that businesses were quick to adopt as a vital office tool. Naturally, hackers got the memo. 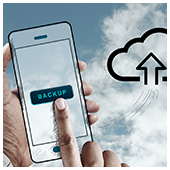 With new schemes targeted specifically towards mobile devices, you’d be well served backing up the files in your mobile device, now.